I’m back to GardeNails to get my nails done last Saturday morning! 2 of my friends were getting married last weekend, so I need to have pretty nails to attend their weddings! Mal helped me with my nails this time, she passed me the latest edition of Nail Max Magazine and I decided to get wild & choose the Leopard Prints designs! Mal is very detailed in taking care of our nails. I told her I want to keep my nail length but she said it’s the good to trim my nails a little shorter in order to prevent my nails being chip off. 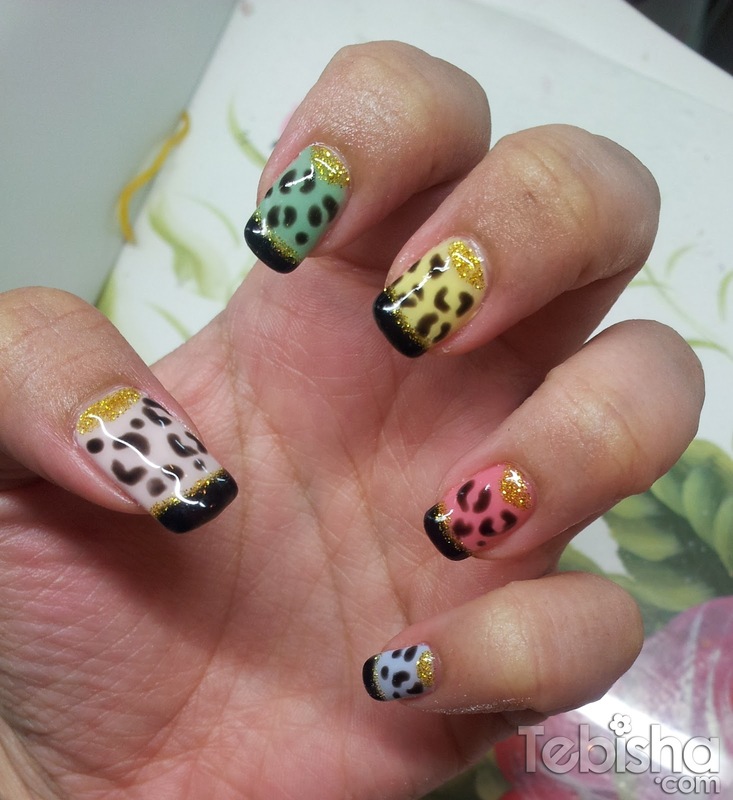 Leopard Prints on Pastel Colors Nails with French black tip and gold shimmer! If you have any designs on your mind or seen any nail art design on the magazine you like, you can always ask Mal to do it for you! With her skills, she can definitely do it on your request! GardeNails started in November 2011, it’s their 1st Anniversary very soon! GardeNails is going to have their 1 Year Anniversary Promotions from October to November 2012! Gelish Manicure + Classic Pedicure $50/-! Gelish manicure + Gelish Pedicure $68/-! Classic Manicure + Classic Pedicure $38/-! Bring a friend along and enjoy greater saving! Gelish Manicure + Classic Pedicure $90/- (For 2 persons)! Gelish manicure + Gelish Pedicure $130/- (For 2 persons)! Classic Manicure + Classic Pedicure $70/- (For 2 persons)! 1 Year Anniversary promotion will valid from 1 October to 30 November 2012! Come and celebrate and beautify your nails with GardeNails! Hurry!!! Call 6310 2669 or text 98517141 for your appointment in October!